How can I write a risotto recipe that starts with  “Roast 1 flock of chickens? Reserve juices.”?? I recently had to roast a lot of chickens, a whole flock of them, and as they cooled, there was all this lovely chicken juice in the bottom of the pans. I put it all in a container, not really sure what I would do with it, but certainly not letting it go to waste. As far as I’m concerned, the best part of the chicken is the burny, toasty brown stuff that gets left on the roasting pan. It’s pure essence of concentrated chicken. Lunchtime rolled around the other day, and getting Chinese food delivered to Montone is clearly not an option so I needed to figure out something that we could eat. Right about now, I’d kill for some good Chinese dumplings, but instead, we took a vote and decided on risotto instead of pasta. It’s tough when there are only 2 people voting, who is the tiebreaker? Yeah, you’re right, it’s the chef. It’s good to be the chef. I decided on a classic risotto Milanese with peas, and then I remembered my magic chicken juice in the fridge. What good luck! 2)	Start adding your liquid, bit by bit. Adding more as it absorbs. I add the wine near the end. Add the shallot near the beginning of the cooking process. Just toss it in the pan. 3)	Butter poach the peas. I take frozen peas (pea season is over, whatcha gonna do?) in a small crockery dish, with that good sized knob of butter, and over very low heat, I let the butter melt and the peas poach. This technique is marvelous; use it whenever you want decadent peas. 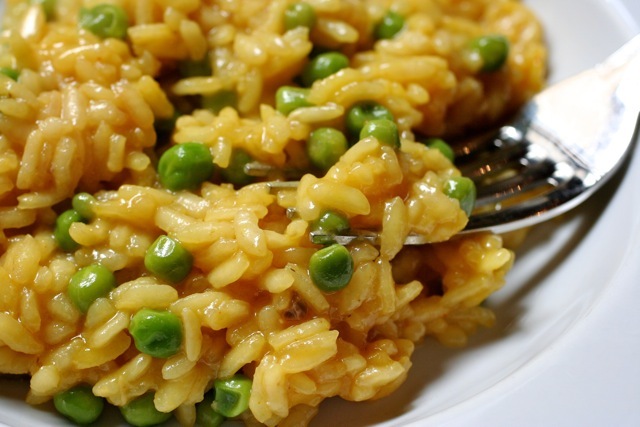 4)	When the rice is done, combine the saffron, cheese and peas…in that order. If there is a moral to the story it has to be that if something looks good enough to keep, keep it, and figure out what to do with it later. Now I have to wait until the next time there is a flock of chickens needing to be roasted before I can get more of the Magic Chicken Juice. If roasting a flock of chickens is not in your future, use good home made chicken stock from a roast chicken, and it too will make you happy.